For quite a long time our testing laboratory hadn’t got an ADSL-switch at our disposal which didn’t give us a possibility to test ADSL routers. That’s why when we obtained DSLAM D-Link DAS-3248EC, we made up our minds to not limit our tests with this vendor’s devices only, but we also asked some other companies for their ADSL-modem. 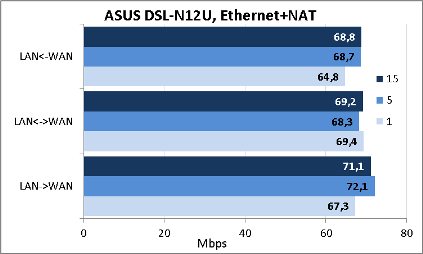 That’s how we got an ASUS DSL-N12U wireless router in our lab, and here’s its review below. 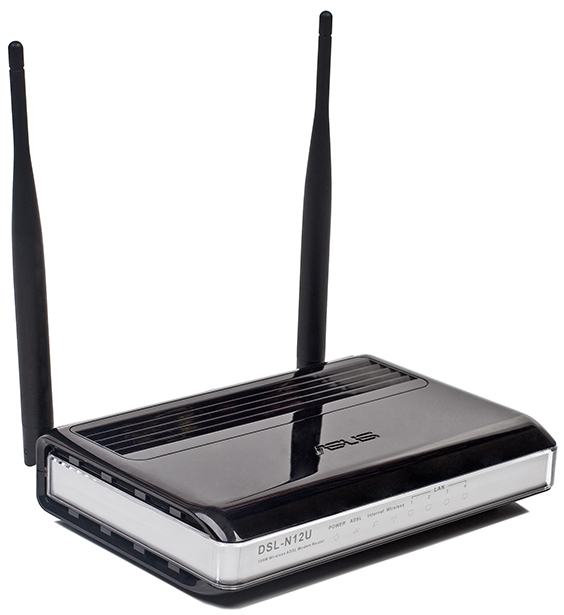 An ASUS DSL-N12U wireless ADSL-router is designed in a black case made of shiny plastic with a grey horizontal panel and dimensions of 179x119x37 mm (excluding the external antennas). For its work the device requires an external power source with the following characteristics: 12V and 1.5A. 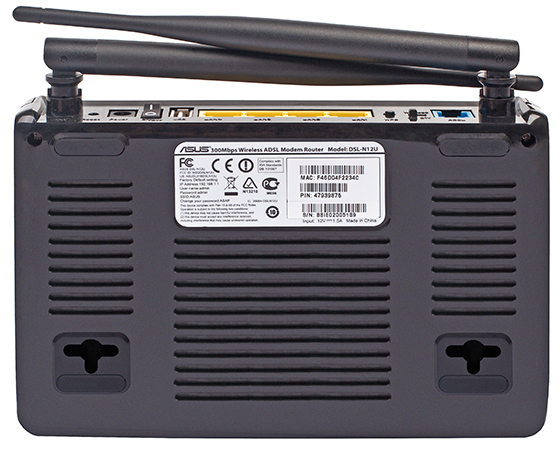 On the front panel there is the model name engraved and some LEDs indicating status of the device and its ports: four for the LAN ports, one for Wi-Fi, an ADSL light indicates the connection with the provider’s equipment (if it doesn’t work, the further adjustment is of no use), and Internet shows the connection to the provider in the mode PPPoA/PPPoE. The side panels are quite featureless: there is a grey plastic panel as well and some small holes for ventilation. The upper panel is shiny and there’s a 3D brand tag on it. The lion’s share of this panel is occupied with a vent. Most part of the device bottom is occupied by the vent and more than that, there is a sticker with some brief information about the model, four rubber stands and two T-shaped technological holes which allow placing the DSL-N12U both on the table and on the wall. On the rear panel there are two non-detachable external antennas with the amplifying factor of 5dBi. Also one can find here four Fast Ethernet ports, one port for connecting the phone line, one USB 2.0 interface, the on/off button, the wireless module Power button and two small round buttons to reset the user’s settings and to simplify connection of new wireless devices. Now let’s have a look inside the device. 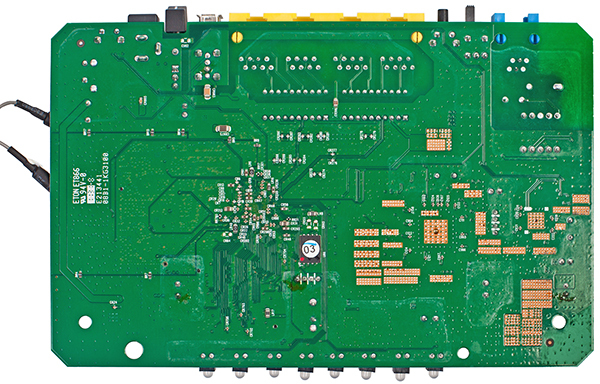 All the electronic stuffing is presented by one green textolite board which main elements are located on one side. The whole system is based on the SoC chip from the Ralink company. 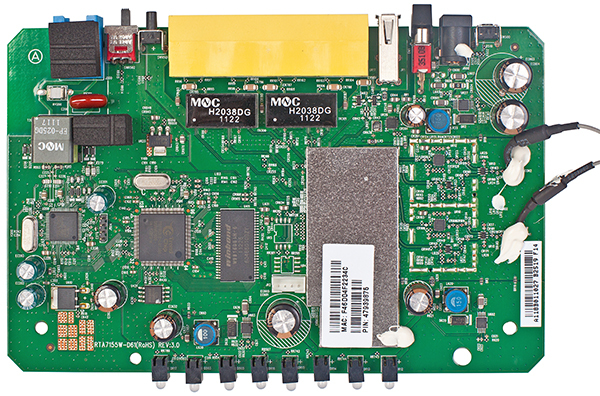 Only three chips are not covered: the Winbond W9816G6IH flash-drive with the capacity of 2Mbyte, the TrendChip TC3162LE-LQ128G CPU and the TrendChip TC3086-QFN64-EPG module which is responsible for working with ADSL. Let’s turn to the software review of the router. 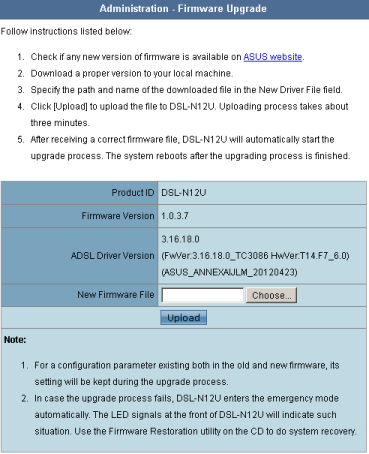 The procedure of firmware upgrade in ASUS DSL-N12U is similar to those models that are suitable for the most of the wireless devices from this vendor – you just need to select the file with a new firmware in the point “Firmware upgrade” in the group “Administration” and press the button “Upload”. The entire process takes approximately three minutes and doesn’t require any special skills from the user. 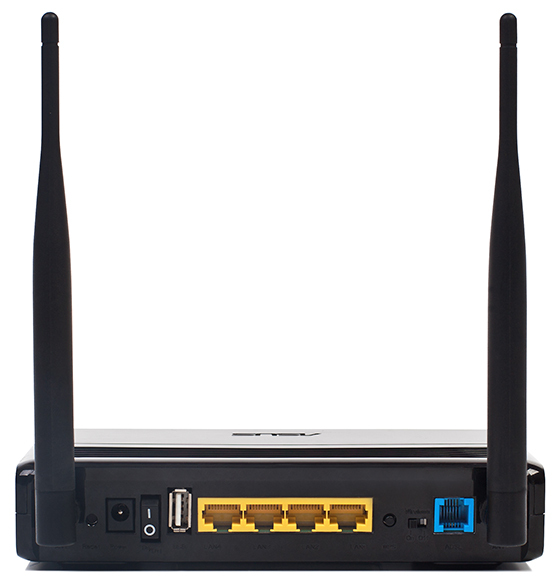 The firmware version is displayed in the point “Firmware upgrade” of the “Administration group” and on the main page of the router itself. If some malfunction occurs while firmware is being updated, ASUS DSL-N12U enters the rescue mode characterized by the power LED slow blinking. It should be mentioned that the user can manually turn on this mode of the router by switching on the device with the Reset button and holding it during ten seconds. Some minor features pointing out the rescue mode of DSL-N12U can be the lack of echo-replies of the protocol ICMP and the fact that its MAC-address becomes equal to 4040.4040.4040. To restore the firmware it’s necessary to use the ASUS Firmware Restoration utility which is a part of the software set for this very model. The restoration procedure is quite simple: you need to choose the file with the firmware needed and click the button “Upload”, all the rest will be accomplished by the utility itself. You can restore the firmware manually, without using any special utilities. It is required to change the IP-address from which the recovery is going to take place. You can find it out with the help of traffic capturing via the Wireshark or TCPdump utilities, generated by the device into the LAN-segment. In our case, ASUS DSL-N12U regularly sent the APR-requests about the address 192.168.1.20, that’s why we used exactly this value for our IP-address of the testing host. After changing the IP-address it’s necessary to send the file with the required firmware to the device with the help of the TFTP protocol and wait for the device to reboot. All the commands are shown below. 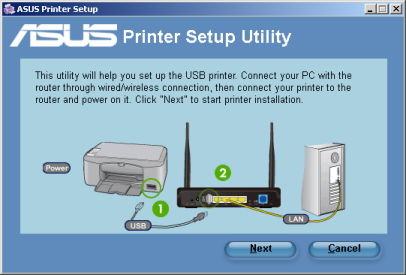 Besides the above-mentioned utility there are also three more ones in the software set for DSL-N12U: Printer Setup, ADSL Setting Wizard and Device Discovery that allow a user/an administrator to install on the stationary PC a printer connected to the router USB port, to configure all the settings of the router for it to work with a certain provider and to detect DSL-N12U in the local segment of the network. Scrutinizing the abilities of each utility is beyond this review, so let’s just turn to the review of the device web-interface. 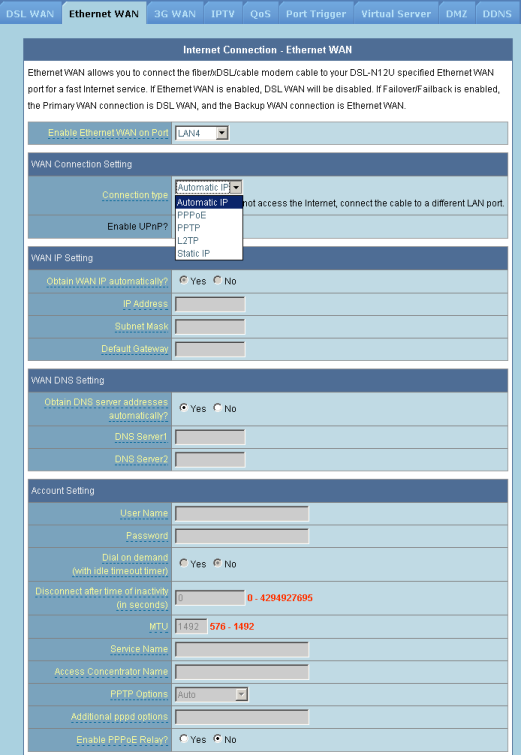 To access the web- interface of the wireless ADSL-router any modern browser can be used. 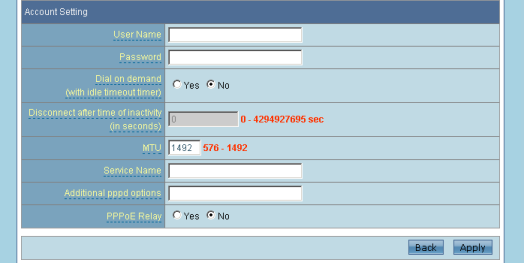 The IP-address of the LAN-interface is 192.168.1.1 by default, the login is admin. Having logged in all the necessary data, the user gets on the start page of the device from which s/he can pass over to the Internet connection Wizard or to the page for configuration of all the preferable traffic types. 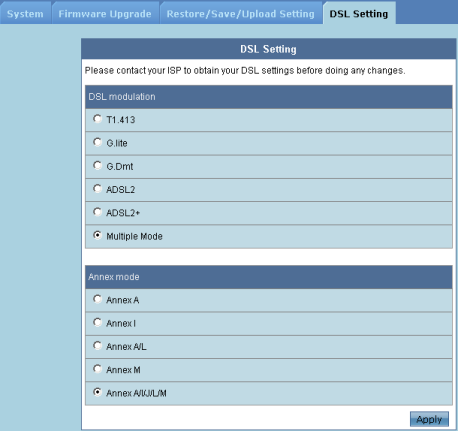 The ASUS DSL-N12U web-interface is available in 14 languages. We would like to mention that more fine adjustments of the services quality are available in the tab “QoS” of the group “WAN”. Moreover, from the start page the user can go straight to the device advance mode. We are not going to look into all the settings, but mention some of the most interesting ones. 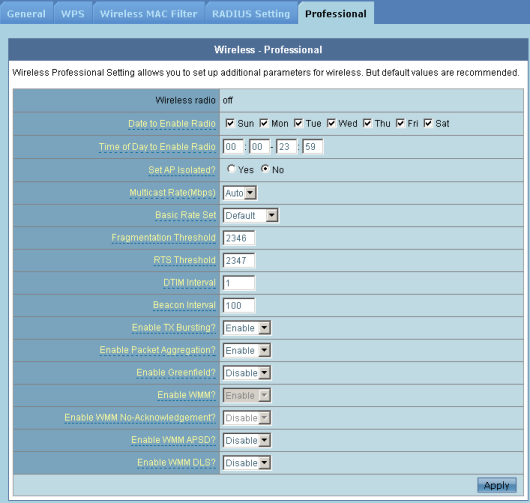 The tab “Professional” in the group “Wireless network” depicts the current state of the module and allows switching it on/off according to the schedule. Also there are some other wireless network fine adjustments available here. 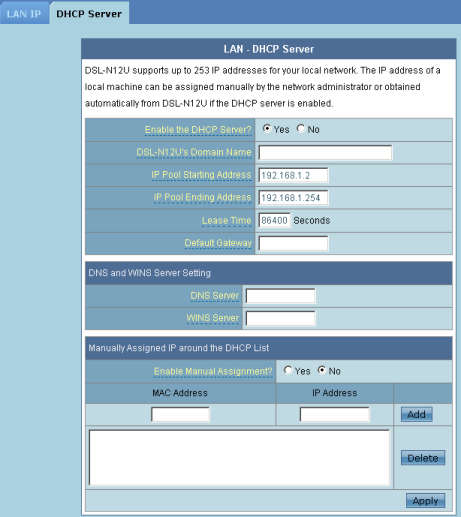 The items “LAN IP-address” and “DHCP-server” of the group “LAN” give an opportunity to not only change the IP-address of the LAN-interface and manage the operating parameters of the DHCP-server, but also to turn on/off the translation of the net addresses (NAT/PAT). 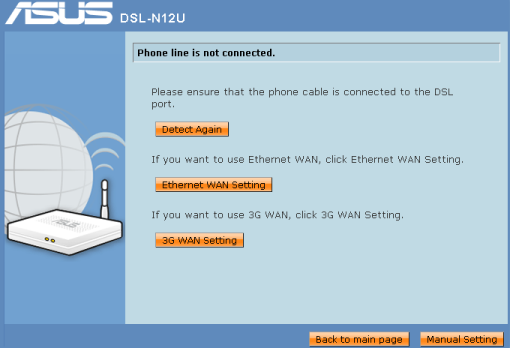 This procedure is completed by choosing the working mode of the router. 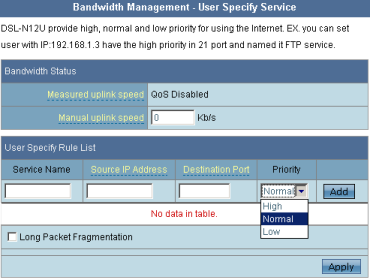 Quite a pleasant option of the DHCP-server turned out to be a possibility to point out the gateway IP-address manually. 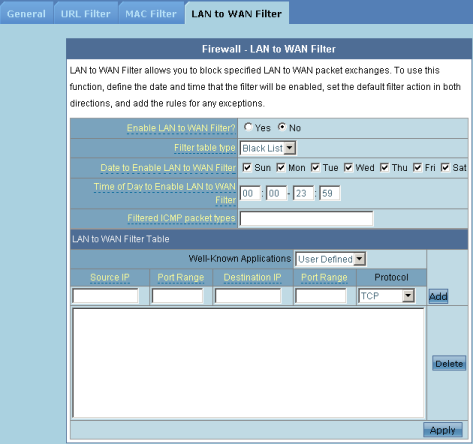 Not only do the sub-items “DSL WAN”, “Ethernet WAN” and “3G WAN” of the “WAN” group allow setting the ADSL-port of the router, but also choosing one of the LAN-interfaces as an Internet link. 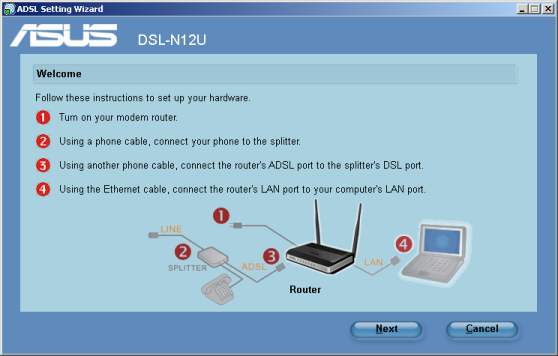 ASUS DSL-N12U can be connected not only to the ADSL and Ethernet providers but also to 3G networks. 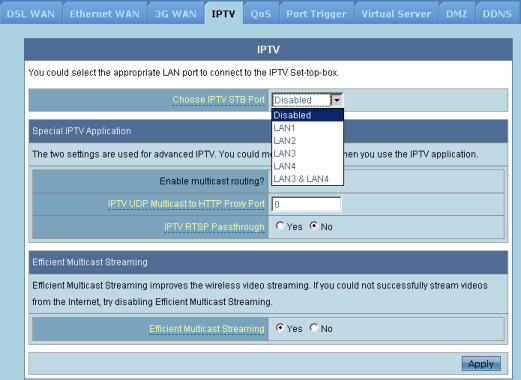 With the help of the tab “IPTV” of the same group the administrator can specify the device ports which set top boxes are connected to. Some other multicast settings are gathered in here. 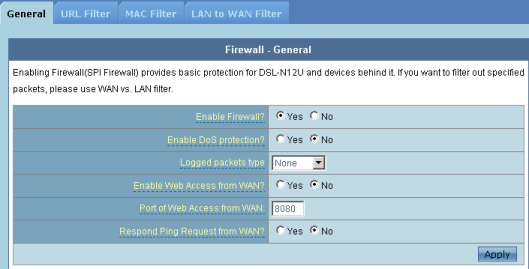 The filter parameters on the basis of URL and MAC addresses can be changed in the tabs of the group “Firewall”. Also it’s possible to get the access to some definite global resources according to the schedule. The tabs of the group “Administration” allow changing the administrator’s password and the parameters of time synchronization, upgrading firmware and managing the user’s settings. 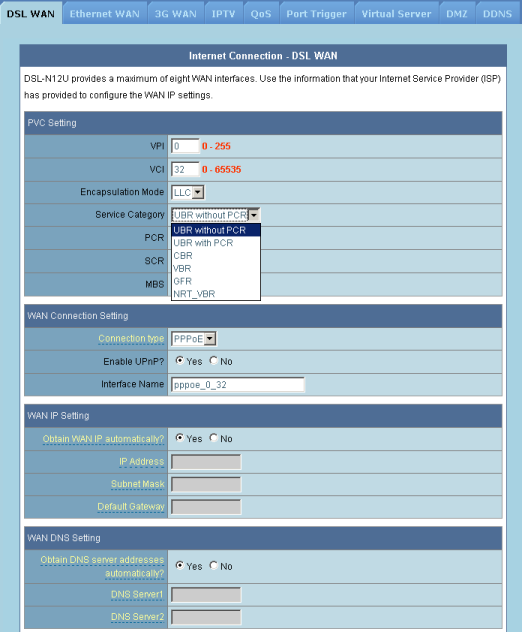 You can find the ADSL-port fine adjustments here too. 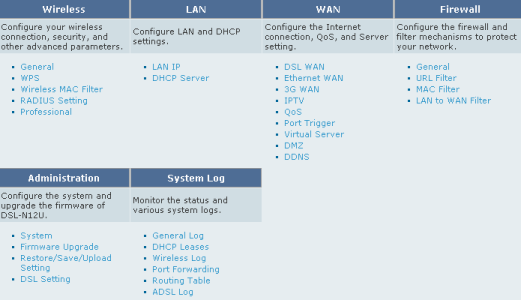 The “Log” group provides the administrator with the access to the log information of the system, DHCP-server, wireless and ADSL modules. Besides this here you can see the routing table and port forwarding table. To one of this group’s minor drawbacks we would like to include the excessively wide Russian titles of the tabs. 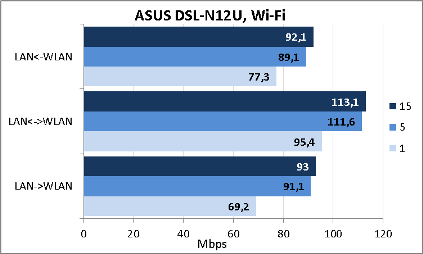 That is the end of our web-interface review of the ASUS DSL-N12U wireless ADSL-router. Let’s switch to learning the functions of the device command line. To access the command line via the Telnet protocol it’s necessary to log in using the same password as to access the router web-interface. 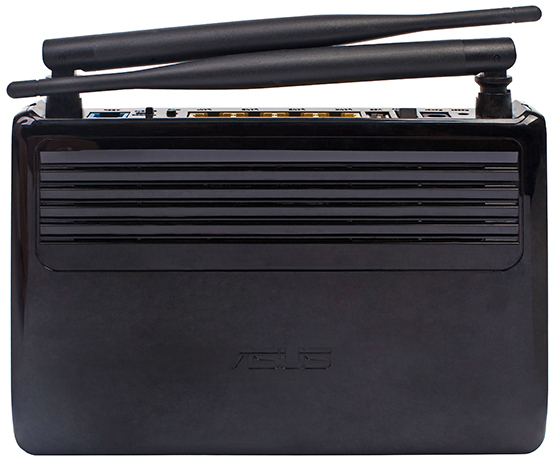 The operating system of the ASUS DSL-N12U wireless router is Linux version 2.6.21 and BusyBox version 1.12.1. Using the command ps let’s see what processes are running at the moment. The top utility will display the data on the current work of these processes. Let’s find out what files are located in the catalogues /bin, /sbin, /usr/bin and /usr/sbin. Now let’s move to the catalogue /proc and have a look at the files we can find here and learn the uptime of the operating system and its average load, and get the information about the installed CPU and the RAM capacity. We can’t help mentioning the nvram utility which allows changing the important parameters of the device. This brings us to the end of the device command line interface review of the ASUS DSL-N12U wireless ADSL-router and pass over to the testing section. The first test which we always start this section with is estimation of the device booting time under which we mean the time interval between switching the power on and receiving the first echo reply via ICMP. 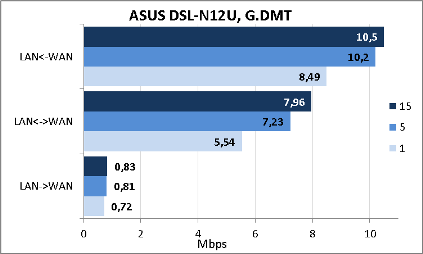 ASUS DSL-N12U boots within 27 seconds and we find it a good result. Our second usual test is to check the security of the device via the Positive Technologies XSpider 7.7 (Demo build 3100) security scanner. On the whole there were twelve open ports detected: TCP-23 (Telnet), TCP-53 (DNS), UDP-53 (DNS), TCP-80 (HTTP), TCP-515 (printer), TCP-3394 (d2k-tapesty2), TCP-3838 (Unavailable), TCP-5473 (unknown), TCP-9100 (Unavailable), TCP-9998 (Unavailable), TCP-18017 (HTTP) and TCP-49152 (HTTP). The most significant information is shown below. Now it’s time for the most long-wanted tests of our readers – the device performance tests. In the table below we display all the main parameters of our testing stand. We started with the estimation of the maximum speed of user data transmission through the wireless segment. 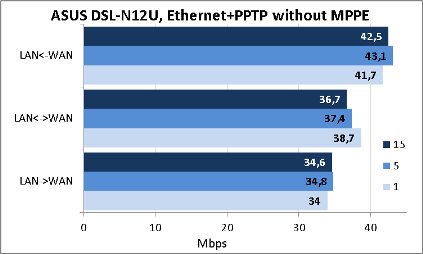 The speeds we got here correspond to the wireless segment performance which means that both wired and wireless networks in DSL-N12U are balanced. 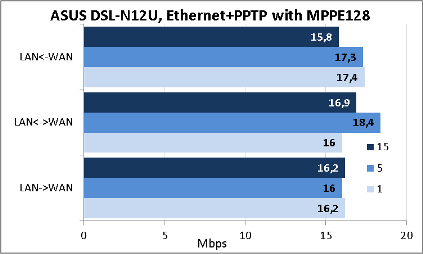 We decided to not limit ourselves with measuring only the maximum speeds that are available in the router, but to check its work in various ADSL-modes. 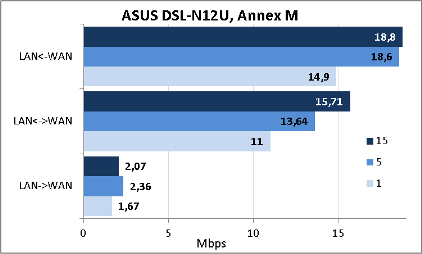 Since ASUS DSL-N12U gives you an opportunity to not only connect to ADSL, but also to Ethernet-providers as well, we made up our minds to find out the speeds which could be available to the user in the following modes: routing and NAT, PPTP tunnel without encrypting and with MPPE128 encrypting. We finish the testing section now and pass over to a conclusion. 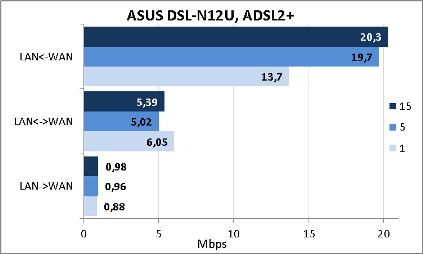 All in all we are satisfied with the ASUS DSL-N12U ADSL-router and a possibility to organize backup connections with the help of wireless USB-modems or Ethernet-providers doubles its attractiveness for ADSL Internet connection. The good points are listed below. Unfortunately, we can’t miss the drawbacks of the tested model. It's impossible to connect external disks or flash-drives to USB. At the moment of writing this article the average price of the ASUS DSL-N12U ADSL-router in Moscow online stores was 2000 rubles.